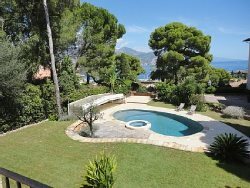 Saint Jean Cap Ferrat sea view, heated pool and jacuzzi, garden, terrace, parking ! Is the home I see on the Internet the one I get? Yes, the property you see on our website is the property you will be staying in. We will give you as many details as possible so that you make an informed decision as we believe that this is the only way to ensure your complete satisfaction with your holiday accommodation. We aim to provide you with a real home, not a standard holiday rental. To do so, we make sure with the owner, that nothing is missing in the kitchen, that even for budget rentals, you benefit from every comfort. We choose our rentals, according to a quality chart and price it accordingly. We know how important a holiday can be. Most of our guests have traveled for hours to arrive on the French Riviera. And we want to make sure that you will not be disappointed. If it's not suitable for children, you will know, high steps, we will tell. If we say the beach is only 5 mn's walk away from the rental, it's 100% true. If we mention that we recommend to have a car, we will explain with all the details per property. Public transportation is just great on the Riviera, as you can get around by bus for 1 € per person/per trip, or catch a train very easily. Now if you are staying for 2 weeks, or if you are travelling with children, you might need the car to go grocery shopping as we don't think it's convenient for anyone to carry bags around on the bus ! We can aslo explain how to get deliveries made right at the door. If you are arriving on a Sunday, we will ask you if you need anything ! Because you should know that stores are mostly closed on Sundays, except for bakeries, or groceries that might only be open in the morning. If you have any questions about online reservations, please contact us. When making your reservation we require a 30% deposit. The remaining balance is processed 60 days prior to check-in. Most properties will be available for check-in at 3:00 or 4:00pm. An early check-in may be possible, some units have an additional fee for a guaranteed early check-in. Check out time is 11:00 a.m (10:00am for some units, check the unit's webpage or your "Approved Reservation" confirmation). A vacation home requires more time to clean than a hotel room. You are a valued guest and we want to do everything possible to make your trip enjoyable and worry free. Because the unforeseen and unexpected can occur before you leave or when you are away from home, we recommend and offer CSA's Guest Cancellation Insurance Plan. For more information on what this insurance covers please Click Here. Your Travel Insurance payment will be processed when you reserve your condo. For detailed travel insurance coverage information, please contact CSA Travel Insurance directly at (866) 999-4018. Cancellation after confirmation of booking results in forfeiture of any and all collected money, except the guest's security deposit and cleaning fee (if applicable) if full payment has been made. However, after cancellation for any reason, if a portion of the rental time is re-booked at the same rate, a pro-rata refund will be made for those dates re-booked. All refunds of rental services payments, whether complete or pro-rata, will be subject to a $50 cancellation fee. To protect against cancellations caused by certain unforeseen events, such as illness, we recommend that guests purchase travel insurance to assure refund of deposits paid. How will I receive my confirmation and arrival instructions from My FFR ? For each property, you will find a description of all the available stores, restaurants, if you need a car, how long it will take to get there. We want to make sure that you are well informed. Occupancy may not exceed what is posted for each property on that unit's webpage. Maximum occupancy includes any infants and/or children. Please check the specific occupancy information provided. Yes, almost all of our rentals have air conditioning, we try to state the number and locations of air conditioners for each property under "Amenities" on the property page, so be sure to check there for specific information regarding the location and number of air conditioners. Is there a fully equipped kitchen in all vacation rentals? Refrigerator, stove , microwave, blender, coffee maker, toaster, pots & pans, dishes, glasses, silverware and cooking utensils, iron and ironing board, vacuum cleaner, broom, and dust pan. Each rental home is different but we always list the details of amenities : some have dishwashers, washers, dryers, some only washers. So make sure to check the list of amenities. Yes, there are linens and towels provided in each home. All bedding is provided and towels are supplied, including beach towels. Are the vacation rentals cleaned daily? No, the vacation home is cleaned before your arrival and after your departure. You can request a Mid-stay Clean at an additional charge, generally between 85 € and 250 € according to property size and number of guests. A Mid-stay Clean includes: changing linens and towels, cleaning all bathrooms, kitchen area, vacuum and dusting, sweeping and mopping and refreshing your starter paper products. A Security Deposit is required for all rentals. In lieu of a CASH deposit, a credit card will be acceptable. Guest acknowledges Agent's authority to charge their credit card for damages to property rented by guest and/or their family and/or guest(s). You are responsible for any damage to the property during your stay. Your liability is not limited to the security deposit. Deposits will be returned 10-14 days after departure. Although a cleaner comes before you arrive and after you leave to ensure the property is clean, you are responsible for leaving the property in the condition you received it in. You are renting some one's home and your should leave it the way you would want your own left. Excess cleaning, if needed, will be held from your security deposit. Since so many people have cell phones, and tenants usually have 2 or more with them, a lot of owners have eliminated land lines in their properties. Some properties have phones, some properties do not. We do not guarantee phones will be available and do not have the numbers of properties that may provide them. Homes are cleaned before your arrival and after your departure. Daily maid service or interim cleaning is available at an additional charge. Rental properties are furnished with clean linens on all beds and bath towels. For your convenience, properties are equipped with kitchenware and supplies for everyday cooking and a STARTER SUPPLY of paper towels, and toilet paper. What about house parties or noise complaints? Rental Guest understands that we will accept families, married couples and responsible adults. You certify that you have read carefully the limitations placed on the number of persons permitted to occupy the premises, and agree to abide by such limitations: if not, you will be asked to leave with no refund. Any complaints will be dealt with on an individual basis. Any use of the rental property for a purpose other than residential use for a family vacation must be approved by the Agent. A request must be submitted before arrival for use for any event such as weddings, receptions, family reunions or other large gatherings. If the event is approved, the Guest may be required to pay an additional deposit to be determined by the Agent and abide by Agent's determination on the requested event. The Agent reserves the right to cancel your rental reservation and occupancy of rental with no refund if Guest misrepresents an event. Certain properties do allow pets (check descriptions). For those properties that do not allow them, if pets are found in or on the property we reserve the right to cancel your reservation, forfeiting deposit and occupancy of the rental unit plus a $200 charge. Please make sure that you clean up after your pet in and around your home and dispose of the waste properly. Any and all damage caused and the resulting charges, i.e. carpet stains, wall damage, pet hair removal, etc will be the responsibility of the tenant. Please respect the property and its surroundings so that we may continue to offer properties that allow our 4 legged friends! There is no smoking inside any property. Unauthorized smoking is grounds for eviction without refund and/ or security deposit forfeiture. Some properties allow smoking outside. Please check the property details to find out. Some of the houses we manage may be available for sale during your stay. If you are staying in a property that is for sale, every effort will be made to schedule showings on a turnover day so as not to intrude on your vacation. Should a request be made to see the property during your stay, you will be contacted in advance by our property management staff, but the final decision is yours.